No, thanks. Just the deodorant for now. Want to try them all before you buy your lifestinks decanter? Want to share lifestinks, but not sure which variety is best for your bestie? 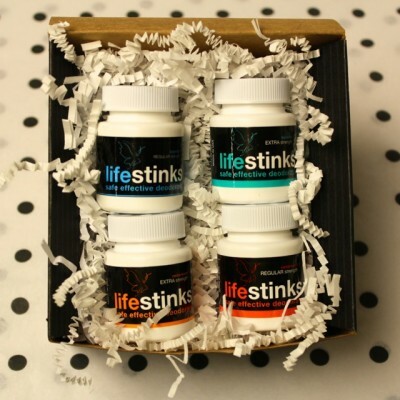 Enter, our brand new lifestinks sampler: the perfect stocking stuffer. Friends and family will ENJOY receiving a 30-day trial of each of our botanical infusions. The perfect gift for the curious green advocate, the health enthusiast, or the high performance athlete on your list. Watch giggles turn to delight as they receive their own lifestinks sampler and can finally experience the deodorant you have been telling them so much about. A chic black pin-striped boxed set and a price point that makes it possible to knock lots of the names off your hard-to-shop-for list. ADD IN A GIFT VOUCHER! Purchase our lifestinks sampler and let your loved one their own personal body ecology. It's tricky to pick just the right infusion for someone else. Once they've made their deodorant decision, assist their ongoing earth ecology investment with a pre-paid voucher for their lifetime decanter. Better yet: include a pre-paid voucher for a "home and away" set to pre-pay their lifetime decanter PLUS their first lifestinks everywhere traveller. We'll take care of all the tax and shipping when they place their follow-up order. Available exclusively from the sisters. Are you ready to jump on board with a deodoant that's good for you, good for the planet and actually works? With each sample dispenser, know that your safe effective deodorant is made with just three simple ingredients – aluminum-free sodium bicarbonate, tea tree oil and lavender or cedarwood oil. We have worked with Australian botanists to ensure our botanical oils are pure, gentle and effective. • Discover your favorite flavor before buying your lifestinks refillable decanter. Its revolutionary delivery system is good for the planet. Lavender, when combined with tea tree, evokes a clean, vivid, fresh sensation that offers gentle dryness while allowing for healthy perspiration. Interested in a warm, buttery, woodsy experience? Enjoy trying cedarwood regular strength or cedarwood extra strength.